Clients often use our EcoSmart grass mats to protect grass from wearing on a larger site from turf erosion. This could be as simple as putting a mat at entry and exit points that would otherwise become a bald patch in the landscape over time making the area unsightly. If you are including a specific point of interest which doesn’t necessarily need fall height protection but will become a feature point, you might also want to protect turf there. 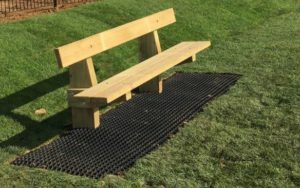 Clients increasingly provide grass matting under seating for those accompanying children at play. This reduces erosion where feet swing and in turn maintenance. If you’d like to discuss using grass mats, please feel free to get in touch! You can reach our experienced team directly on 01564 742 811. Alternatively, why not take a look at our free guide to grass mats? You can download it by clicking here! The guide contains information on playground surfaces that can be used to protect grass from wearing.